Back to road logs! Last time the black cloud over my head parted (after thoroughly dousing me with rain) and I experienced a new level of kindness on my Journey. This time, I put the difficulties behind me and try to race to Vicksburg on the promise of a comfortable bed. Since the previous 48 hours included head stroke, exhaustion, hypothermia, and little real rest, I had no problem sleeping on the stage in a church gymnasium. I did have a problem waking up, but there wasn’t much choice: Pastor Brian needed me out by 8:00 so I wouldn’t be in the way of church members arriving to start Sunday youth programs. I woke up on time, groggy eyed, and raced to get things ready. But people arrived early. I could hear voices outside soon a volunteer was in the giant kitchen, prepping things. At first no one really paid attention to me; this is what you might call a “mega church” and I suppose not all the community members know each other. But they do know that loading up a bicycle with camping gear is not a common church activity, and soon they had questions. They were as friendly as you could possibly imagine—no one insinuated I was trespassing. And when I said I had the Pastor’s permission, it was clear that was all I needed. But I worried, suddenly, that my presence might raise questions Brian had hoped not to answer, or that I’d have to start refusing invites to attend service. I scrambled my bike out the door and hit the open road. For a few minutes, anyway. This was an earlier start than I normally had, and I was famished. I located a Shoney’s in town and biked over to eat. I ordered the largest breakfast special they had, not worried about the piles of carbs before me given that I was burning about 6,000 calories a day. I ate staring out the window at the sky. Grey clouds raced on the north wind, evoking yesterday’s chills. But my heart was high. I’ll always remember that time: the elements seething outside, me me sipping cup after cup of coffee, the adventurer enjoying a small delight. For that moment I was totally free from fear. When I finally went outside, I stayed warm for hours. That’s a good chunk of what I remember about the road to Vicksburg. I continued on the scenic River Road, and halfway through the day it merged onto the main highway. Eventually I crossed the Yazoo River and its Yazoo Pass, which made the name of the cafe back in Clarksdale make a lot more sense. My map app wanted me to follow Highway 61 all the way into town but, remembering freeway conditions near other larger cities, I planned my own course that involved rural roads once I got close. I made poorer time than I expected, but didn’t really care. The sun was low when I turned off 61 onto a disused side road. I was about to experience two things: truly mystical terrain and a new opportunity to get lost. Mississippi is, in my opinion, one of the most beautiful states in our country. The terrain near Vicksburg–built on a bluff over the magnificent Mississippi–is hilly, almost mountainous. I would have believed that some of the vistas were from a lazy corner of Appalachia. Or, for that matter, a fantasy world: soon entire forests were covered with a blanket of choking vine, a solid rolling expanse of green. Mighty oaks rose like moss-covered rocks, smooth and branchless under their creepers. The cliffs and wore the same shroud. Mist drifted from these surroundings, huddling in the shady lows like a magic tide on the rise. I breathed the air and chanted to the local gods. The local people were in less opulent straits. The landscape alone could have convinced me I was back in rural Thailand; the houses proved it. Tiny cabins housed large families, many cooking over an open fire outside. Brush or garbage fires burned as well, and smoke drifted across the highway. I waved as I passed. Little dark-skinned children watched me go by with curiosity, or yelled and pointed me out to their parents and grandparents, who waved back. I passed a time-beaten church closed up for the evening, and then the forested hillside dropped away and so did the homes. I found myself in open fields. This nagged at my navigating instinct. Shouldn’t I be seeing more and bigger houses as I got closer to the city? But the road was winding and had many turns, and I decided to trust the directions I’d gotten from Google. I enjoyed the evening ride, knowing I would reach a house with a real bed and a real shower before sunset. I texted Carla, the host at that house, with an ETA less than an hour out. She told me they had another Couchsurfer as well, a girl from Germany, and that they were cooking a huge dinner. I’d be right on time. But when the fields gave way to endless industrial structures—no cityscape on the horizon—I knew I’d done something wrong. Finally I pulled over and brought up the map again. I was on the prescribed route but, looking carefully, it led to the wrong destination. Some rural road had a name similar to the street where Carla lives, and Google had aimed me there instead of downtown Vicksburg. I laughed. Like so many times on my Adventure, the moment when comfort is closest is exactly when one last obstacle reared its head. I could only shake my head at the fading Sun, who watched all this with barely a smirk, and laugh at myself. Soon I’d routed the correct address (another hour away) and informed Carla, who was very understanding. But now I pedaled with a fire: I was hungry, and tired, and didn’t want to enter a city at nightfall. I wondered if the families would think it was funny when I biked past a second time in the opposite direction, but my turnoff came before I reached many houses. One road led to another, I found my urban surroundings, and a single uphill chug took me into the heart off historic Vicksburg. It was dusk. A little after downtown was the beautiful, aged street where Carla lived with her roommate Ryan. I had a final moment of uncertainty in the grey light, the spot where their address should be containing no clear house and no clear driveway, but wandering down a packed-earth alleyway landed me at their door. Their house perched just above the winding Mississippi. The sun’s last glow faded and Carla, Ryan, Katya and two puppies cheerfully received me. Made it again, Rogue Priest. 98.5 miles. 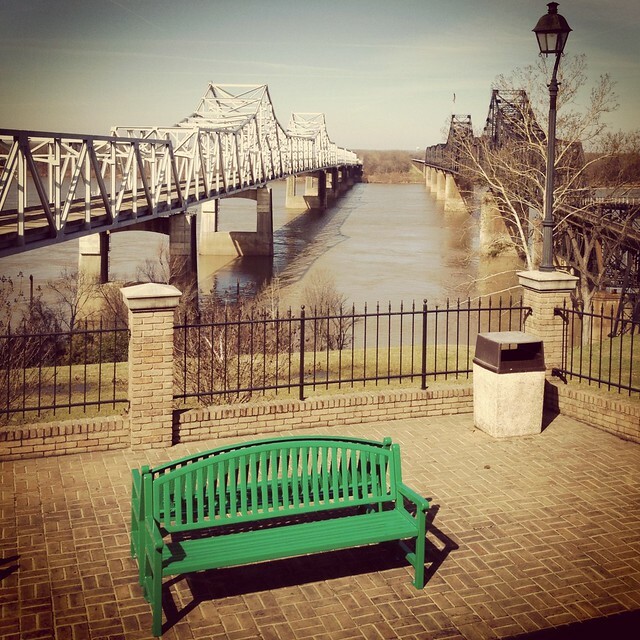 I completely fell in love with Vicksburg over the course of just a few days. I’ll tell you all about it next time, and until then you can also check out my past road logs. You can also sign up to bike a leg with me. And now I feel like I really missed something when I passed MS going to GA without stopping. Stopped in AR, as usual, which was nice (nifty geology, a submarine, and winding woodsy roads, hooray), but next time I may postpone the interlude til I get to Mississippi. Cuz why not. Hopefully I’ll be going to Montogmery next year anyway… so I shall stop by. I hope you do get a chance to go there! If you do, consider trying out CouchSurfing (if you haven’t already). It’s a great way to meet local people who are almost always incredibly cool. When you took the wrong turn you were across the Mississippi river from where I grew up. (Sondheimer, La) The vines choking everything are Kudzu an invasive species willingly planted here, not knowing their predatory nature. As I read your article I pictured it all in my mind—the shacks, the children, the vines–and felt a powerful nostalgia. Ha! I’m glad I could describe it that well. It really had a profound effect on me.